So from Krakow, Poland we took an 8.5 hour “sleeper” train to Vienna. As you can imagine it was VERY EXCITING for the junior members of our clan. We split up into two cars. Inez and I drew straws to see who would get the “more hyper” child for the night. I lost. 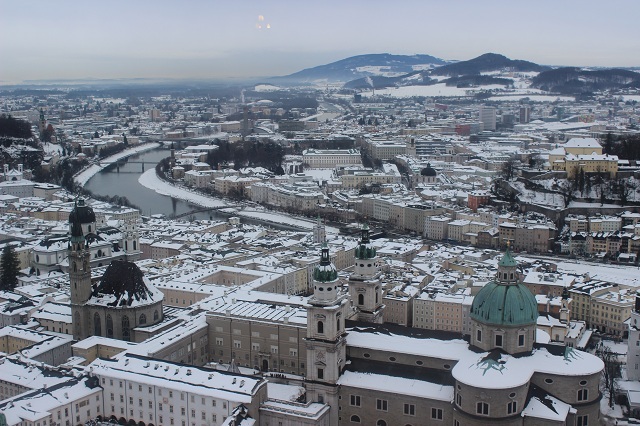 We arrived in Vienna on New Year’s Eve….very early in the morning – 6:30ish. It’s called “Wien” in German and we weren’t quite sure which of the three “Wien” stops to get off at. But we managed. Though it was already apparent that the natives weren’t as fluent in English as they were in Poland. At the Westbahnhof train station we killed some time – buying train tickets for departure to Salzburg in a couple days and by grabbing some breakfast. Our cab (20 euros) took us to the Ritz Carlton and we actually did have a room booked there for us. Thank you, Marriott Rewards! Okay we were trying to check in waaaaay before check-in time and furthermore, we weren’t completely honest about how many people we were. You see, it’s not easy to get a room for 4 people in European hotels. There just aren’t that many big rooms and when they do have them they hit you with all sorts of extra per-person charges. So the kids were under strict orders to be inconspicuous in the corner of the hotel while Mom checked us in. They were going to assess an additional 80 euros per night for an extra rollaway bed in the room. So much for our free nights courtesy of Marriott Points! But they let us check in early and the room ended up being terrific. We told them to hold the extra bed because both the kids could manage on the couch. After settling in, we bundled up for a long walk through the City of Vienna. 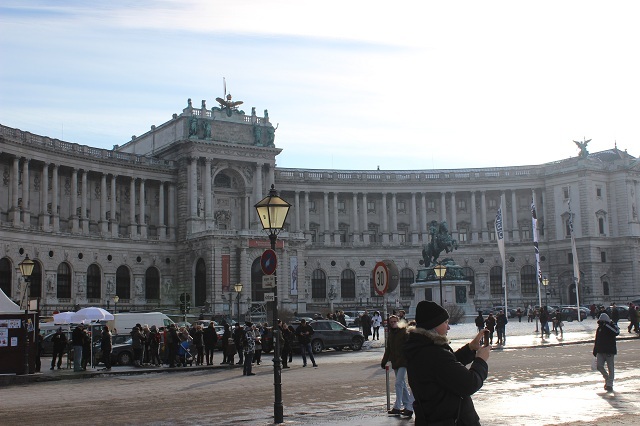 We saw St. Stephen’s Cathedral, the Spanish Riding School, Hofburg (Hapsburg) Palace, many Christmas Market stalls selling their wares, the Parliament Building and also the famous Vienna Opera House. You can see all of my pics in the VIENNA GALLERY. Then it was back to the hotel, THE RITZ CARLTON!! !, to rest up for the Eve celebration. Except that the kids went to the hotel pool and swam up a storm. So they rested up after that. Room service for dinner and then we set out for the festivities at Saint Stephens Square around 10pm. Well it was sort of a bummer the partying that is. You can read the details in at the Homeschool Post. On New Year’s Day we were up early and taking advantage of the hotel’s gym. It’s not very often the case for European hotels! Inez planned to take the kids to the Music Museum just a few blocks away. I stayed at the hotel – after all I’ve been to a bazillion museums this past year we’ve been living in London….and I figured that this particular museum might be a dud. I’m glad they liked it. For lunch we went to Purstner for authentic Austrian food. It did not disappoint. The food was great. We finally had schnitzel, spaetzle, and more Hungarian goulash. This was the best restaurant we dined at across all three cities. That was a late and very heavy lunch so we took it easy. We went back to the hotel and I made the kids wait 30 minutes before going in the pool (haha). And then we just ate our “supermarket food” for dinner. Well at least they did. I sneaked out for a streetside Bratwurst at night. I would say that Vienna reminded me a lot of Paris with it’s huge palatial buildings, wide streets, and ubiquitous statues and artwork. It was very clean and very safe. People were generally pretty nice although we were at the Ritz so maybe our view is a little distorted? Actually I tried to ask directions a few times and people were really rude to me. But whatever. I’ll learn German when German-speakers win a war or lead the world in business or culture! 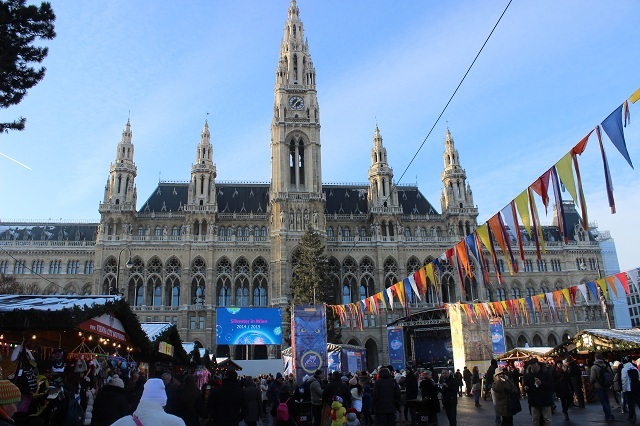 Vienna’s Christmas Markets, their stalls, blew away Belgium’s (see my post), the post-holiday residual ones we encountered in Poland, and London’s on the Southbank and at Winter Wonderland (Hyde Park). 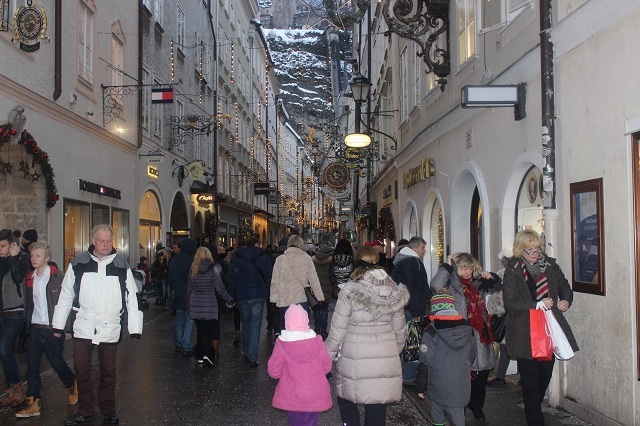 Vienna had more vendors, more impressive wares,….and better food. It’s tough to see much of a city in so short of a burst and a trip can easily turn disappointing if one experiences bad weather and maybe chooses the wrong attractions and restaurants. 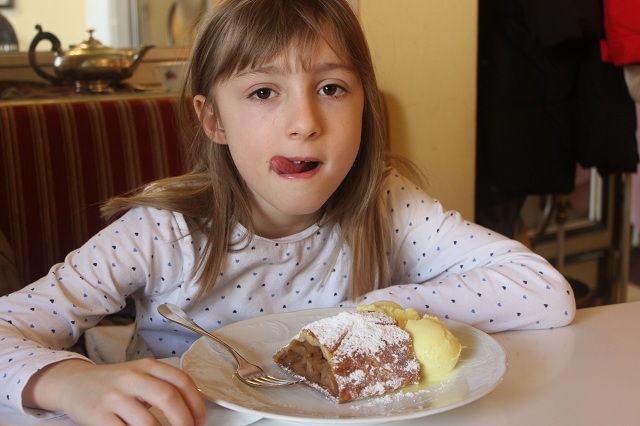 I would say that Vienna teetered on being a “dud” for us but was saved by that great restaurant we found and by how much the kids enjoyed the Music Museum. And here’s another link to our VIENNA GALLERY where you’ll find many more pics of the city, of the food, pics of the New Year’s Eve festivities, and even a couple of me taken from a low vantage point (i.e. my daughter’s height). So Friday, January 2nd, we checked out and thankfully weren’t charged anything for sneaking our kids into a room….without beds for them! A 15 euro cab ride took us back to the train station. In my 40 years of life, it was the “slowest” driving cab I’d ever been in. You see, in Vienna they had some police transponders or something in the cabs that constantly monitor cab’s speed! 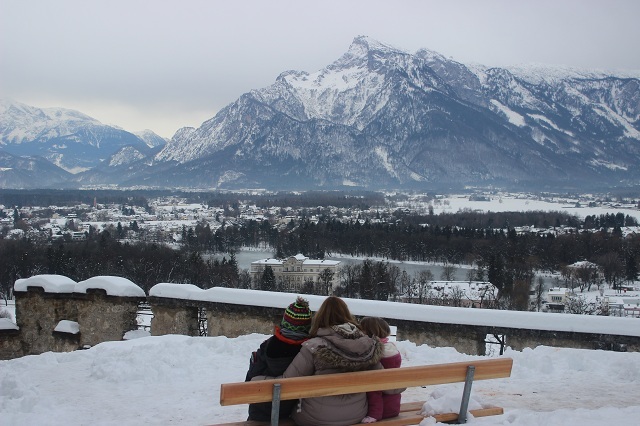 It was a 2.5 hour beautiful, snowy and scenic ride to Salzburg. We had slight trouble getting a cab from the station as the first two in line refused to take us (because we had a lot of luggage?). Eventually we got to our hotel which wasn’t cheap but was very stylish and modern. It had many bells and whistles – my favorite of which was a CD player with several CDs to choose from. I plopped in Haydn right off the bat to set the mood. 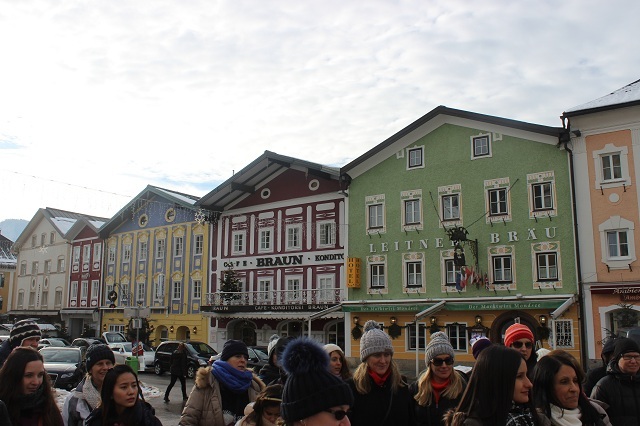 After settling in we took a long walk through town, across the Salzach River, and into the “Old Town”. The Old Town is full of, what else, but shops, cafes, restaurants, and people! We grabbed a bite from the only non-sitdown eatery we could find – a stand selling Bosnas which are sausages with mustard and curry powder. 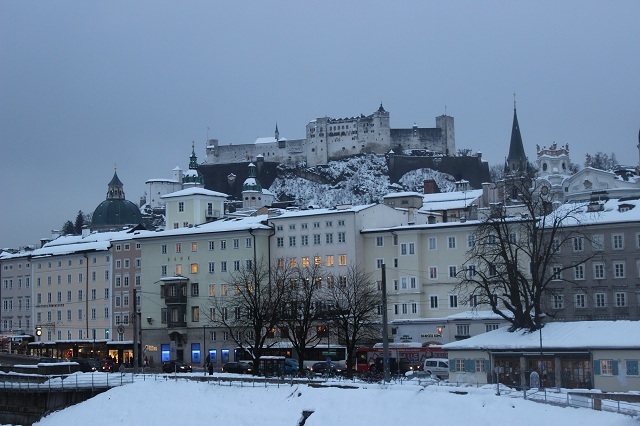 Perched high above town is Hohensalzburg Castle. 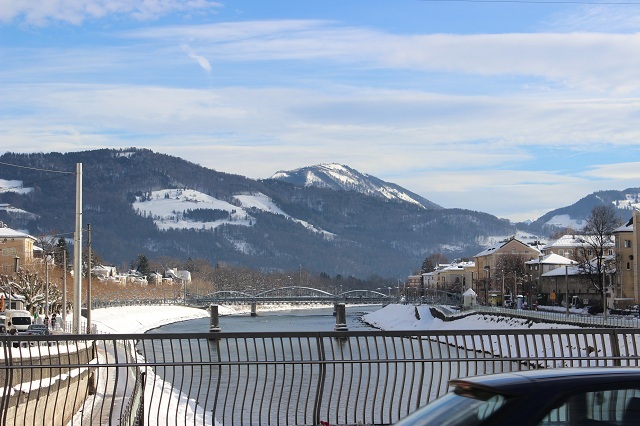 There’s a funicular that will carry one up to it but as the lead guide I intentionally led my family away from it….so we could hike up, get exercise, and save some euros! The castle is awesome to look at – but only from a distance. If you go there I would advise you to NOT go inside it. Entry costs money (18€ for a family) but even worse than that….you can’t see a blasted thing from inside! And I had a hunch about this beforehand. What would you expect? It’s a defensive castle with high impenetrable walls and tiny slits for windows. So when you go, just walk up to the right of it and you’ll be treated to some magnificent views of the city and the mountains. Inez is looking at the Von Trapp mansion below and dreaming she had a musical governess, fresh out of the convent, to attend to her house, her children, and her beleaguered husband. In case I lost you….it’s all from The Sound of Music. The kids had a great time up there because the snow was wet and they were in snowball heaven. It did start to drizzle a bit and so we made our way back across the river to our hotel. And sick of Austrian food we opted for an Italian restaurant. Afterwards I bought some of those Mozart balls for dessert – at least for myself. Saturday morning, we enjoyed an amazing breakfast at the hotel. Well, it had better be good based on what we were paying ($400 an night!). A tour shuttle came to pick us up. The driver made small talk and informed us that “our kids REALLY ought to go to school”. I’m not quite sure what “school” did for him as he was middle-aged and doing menial, unskilled labor but….well he was sincere in his concern anyway! What exactly did my wife plan for the day? Yeah, it was a real “chick” sort of tour that traveled to various location shoots (mansions, gazebo, the church, etc.) and told the backstory to that super-famous movie. It was actually very fun, very educational, and nice to drive outside the town and through the mountains a bit. We stopped for lunch in the small village which housed the famous church where Julie Andrews married the rich guy at the end of the movie. They did play many of the songs and video clips from the movie on the bus which was fun and I do have some good footage. However I can’t upload them to YouTube on account of setting off *copyright infringement* alarms. 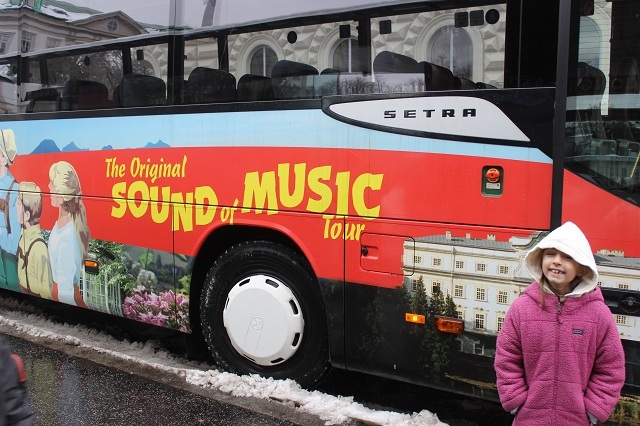 The tour terminated back at Mirabell Gardens where Do Re Mi was filmed. Next up was Mozart’s Residence Museum. But I would say that you can safely skip this museum. It was kind of a dud. Tired after a long day, we retired to the hotel room and let the kids watch a Harry Potter DVD. Since we don’t have a TV or let them watch much in the way of movies, they were in heaven! Our last day we took it easy. Inez brought the kids back up to the Fortress where they played in the snow and gave Dad an afternoon to himself – to relax and read in the hotel. At 5pm we went to the famous Marionette Theatre to see a production of Snow White. 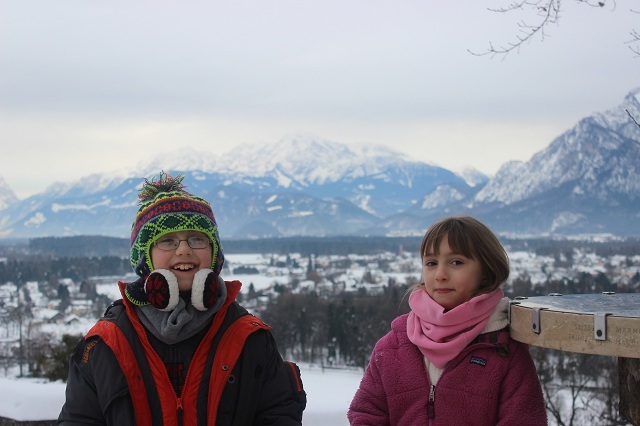 It was all in German with scant subtitles but the kids and Inez enjoyed it very much. I may or may not have dozed off. I’m going to leave you with a video montage from Salzburg. The first minute of it is all footage from the train ride from Vienna. 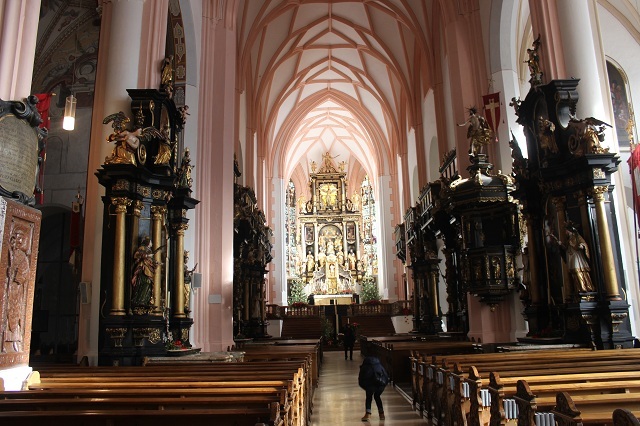 Salzburg is definitely worth going to. It’s absolutely beautiful and now I’m wishing that I could see it in the summertime. However, it’s not that big and probably doesn’t require more than 3-4 days max to see it all. And if you haven’t already, do check out my post on the first part of this trip – Bundling Up in Krakow, Poland. 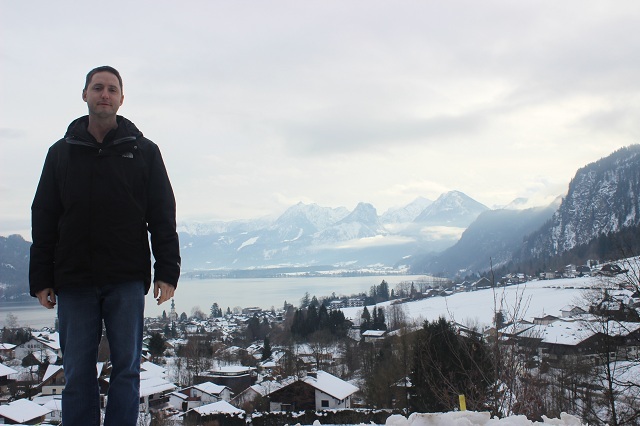 Next trip – the Swiss Alps! Thanks for all the travel tips. Hope to be able to use them one day!